Last night we had our closest friends and their British parents over for dinner. The husband’s parents have been visiting the states for the past five weeks and are headed back home on Tuesday, so we had them over for a bon voyage dinner. 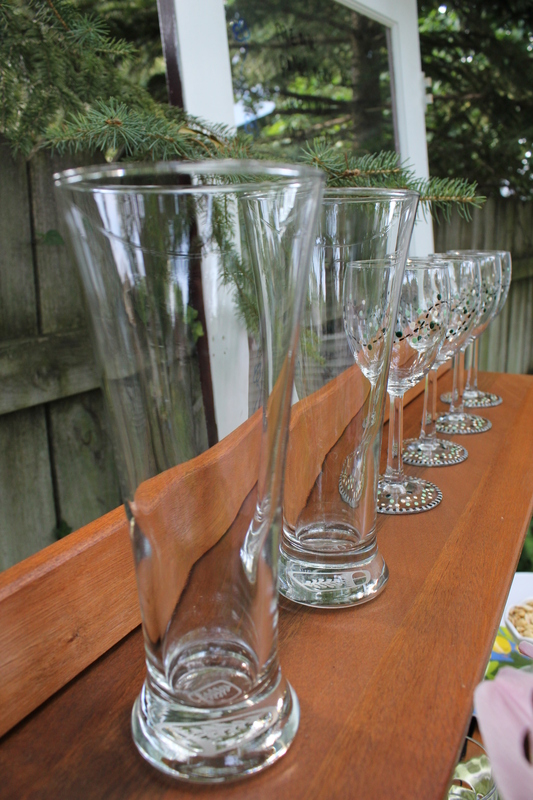 I wanted to give the table a festive, summery feel and also create an outdoor bar. 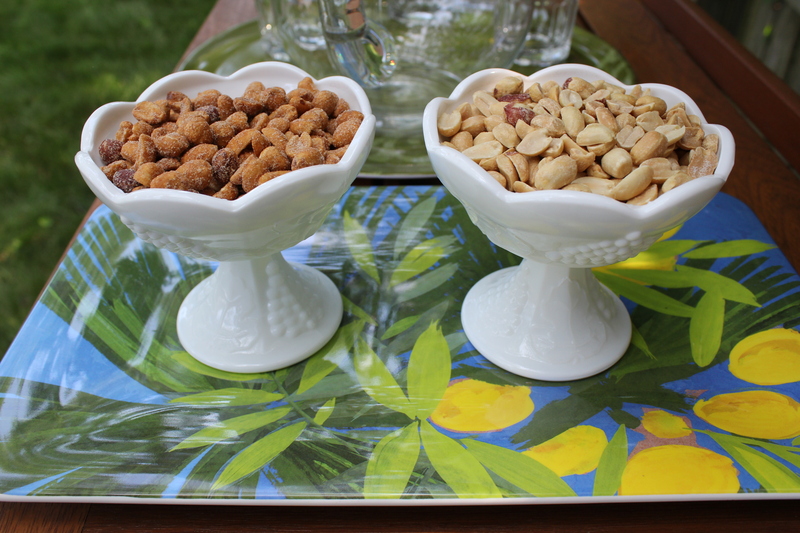 I was able to do both things using only items we already had around our home as well as a recently found (read- FREE!) door…you’ll understand in a minute! Creating a color palette allowed me to quickly utilize items around my home without needing to purchase extra table decor items. 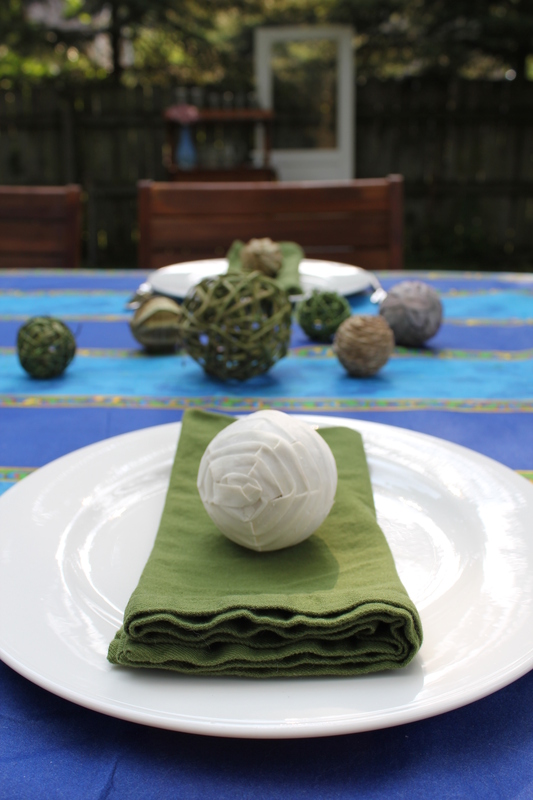 I pulled out a tablecloth, purchased at Target a few years ago (it is actually disposable but is so heavy duty that I’ve been able to use it more than once – I wish that it were cloth because I really like it!) and pulled out the yellows, greens, and even a bit of pink to inspire the rest of the decor. Then, it was a matter of grabbing what worked from around the house. 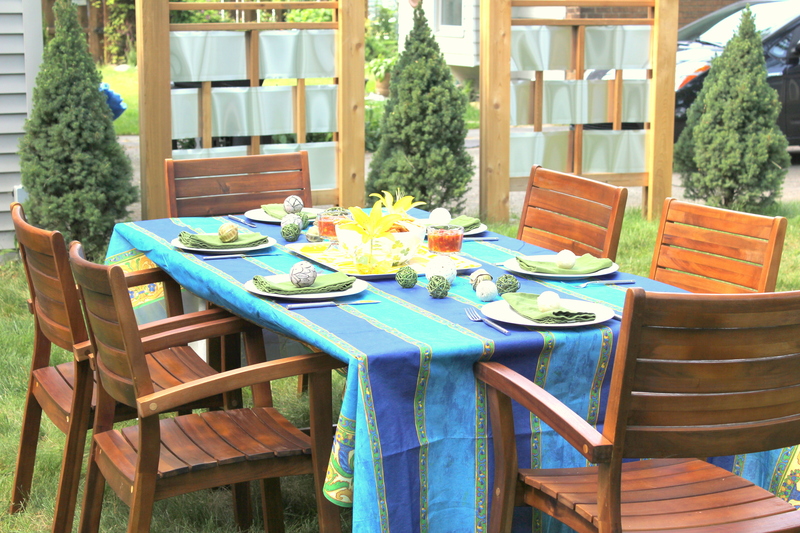 Here is a view of the table, with the privacy panels hard at work! 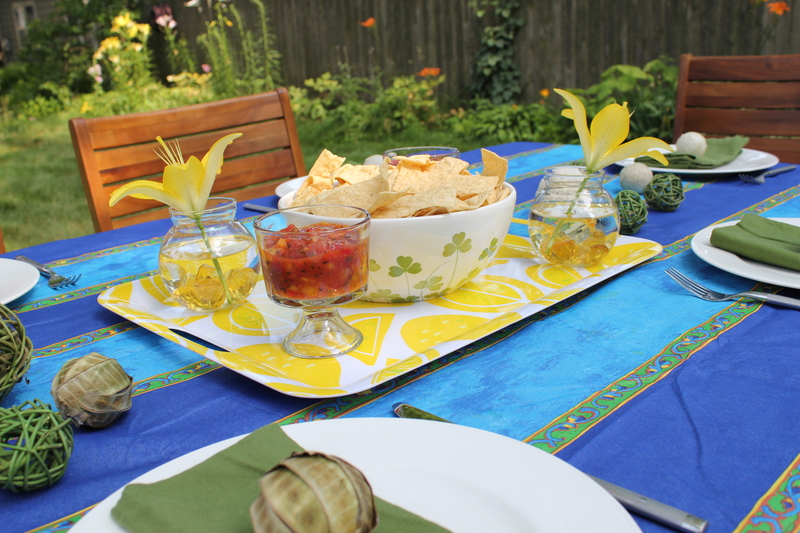 For the center of the table, I used a large lemon tray and topped it with the appetizer – chips and mango salsa. I used two bowls of salsa so that both ends of the table could easily get to it. Then, I added two small vases with yellow lilies straight from our garden, placing a few gold “crystals” in the bottom. When the table was almost finished, I realized it needed a bit more detailing, so I cruised the house looking for anything with coordinating colors. 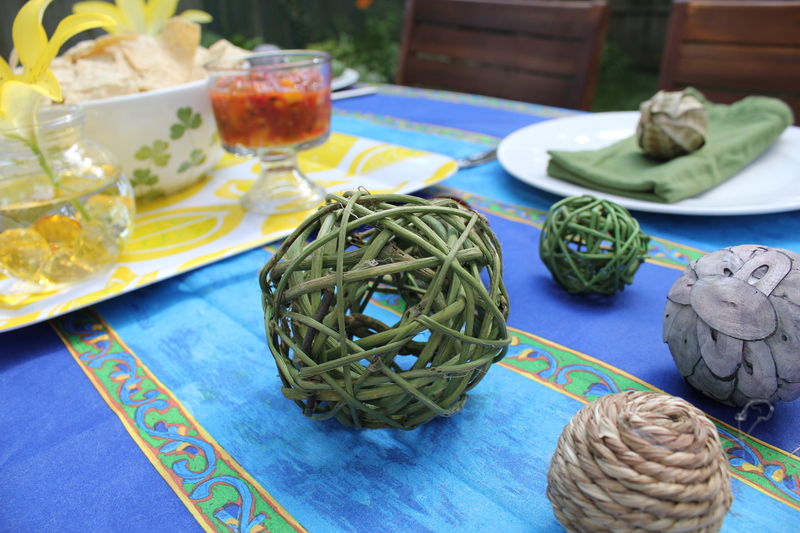 In our living room, these decorative balls sit in a vase on my side table. 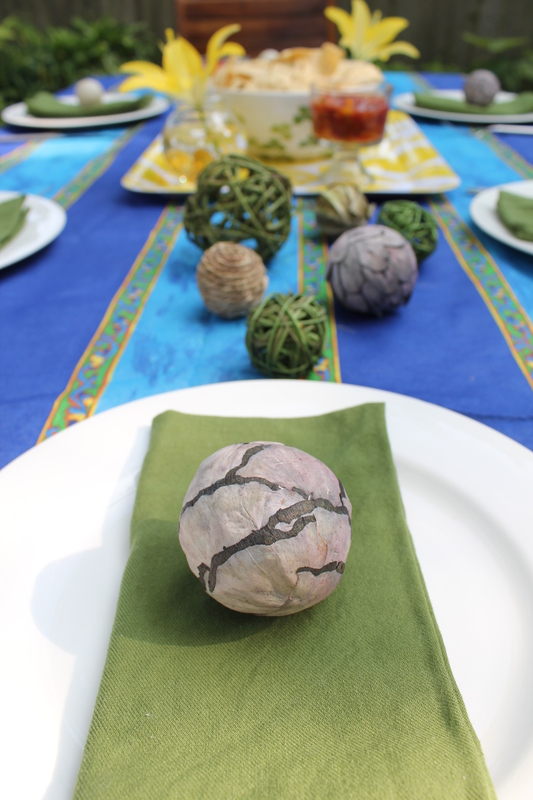 On this table, they added some visual interest along the center and on each place setting! I love how fresh flowers can brighten up any space. 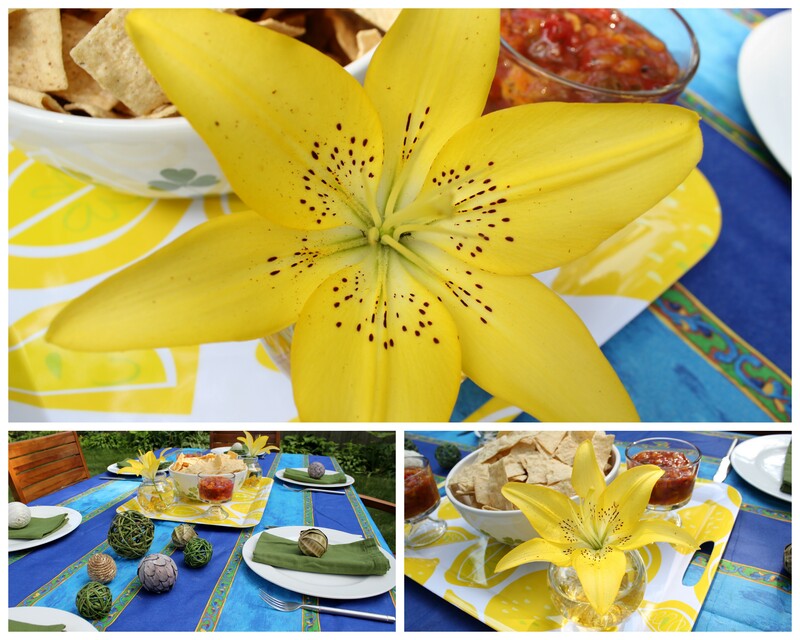 Flowers are an easy way to bring color and life to a table, room, or even outfit. 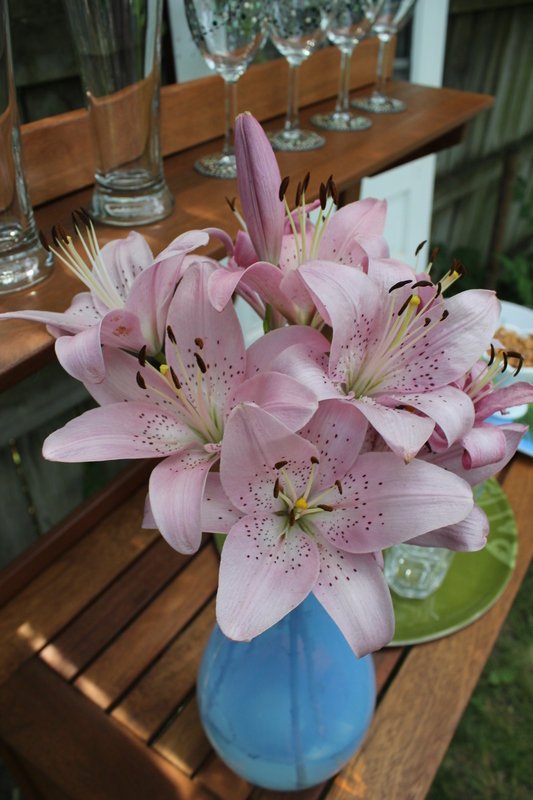 Even though we cleared much of our backyard, we still get a LOT of lilies blooming this time of year, so I took advantage of them! 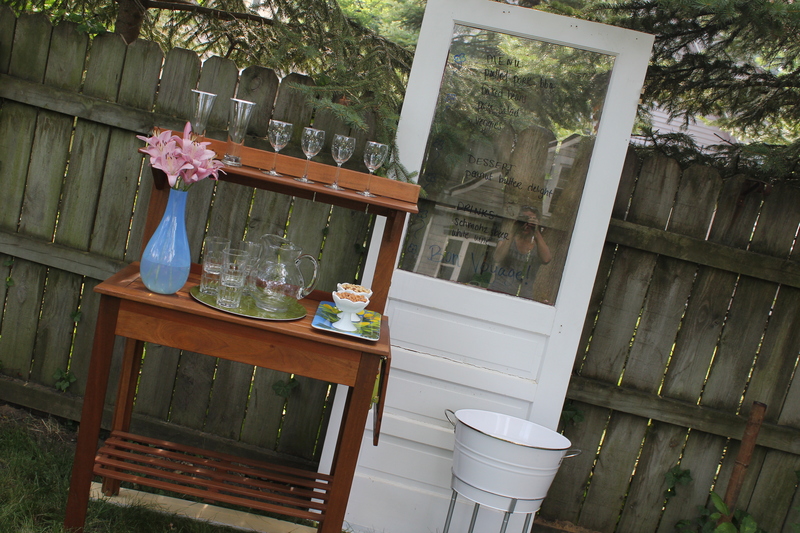 The drink station was created from a potting bench from World Market (yeah, right – looks like a bar to me! ), a beverage tub and stand from Target, and a free door. Yes, we picked this door up from the side of the road just the day before the party! The window worked perfectly for displaying the menu (I couldn’t get it to photograph well, so use your imagination on what we ate…). And, it’s just cute decor for the backyard. 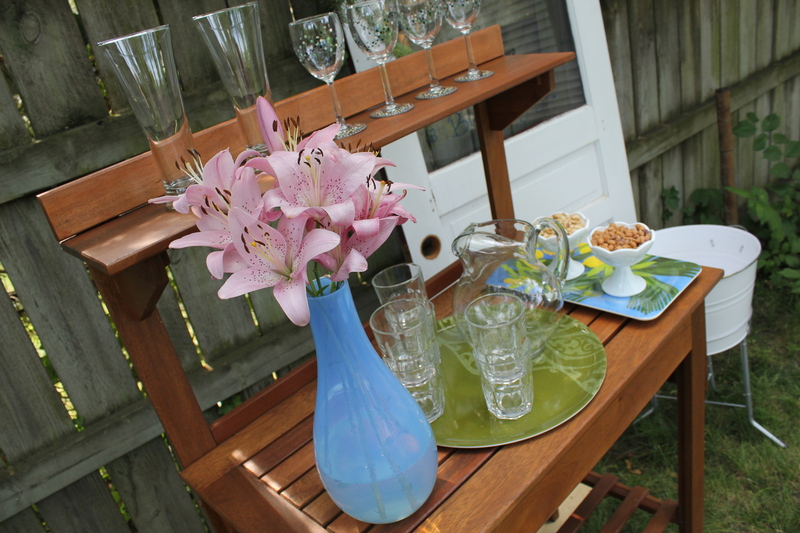 On the bar, more fresh lilies arranged in a blue vase with two coordinating trays ties in the colors from the main table. 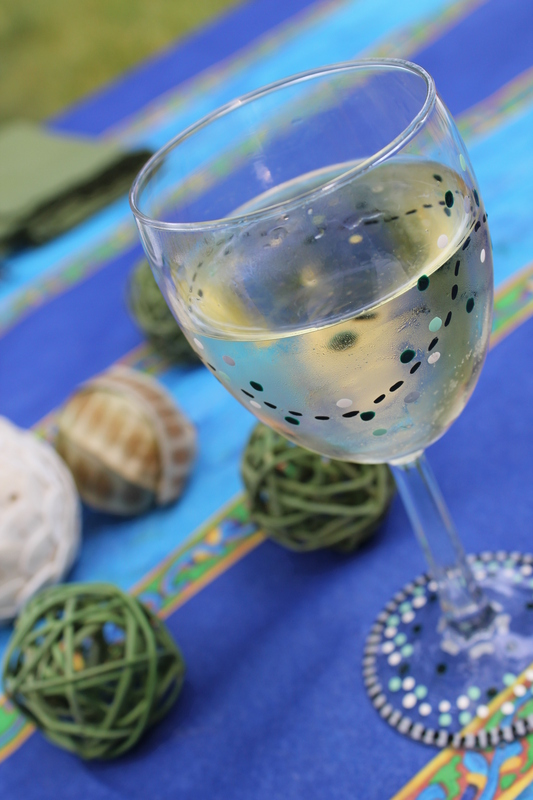 Hand painted wine glasses that we received as favors at a wedding we recently attended worked perfectly with the colors! 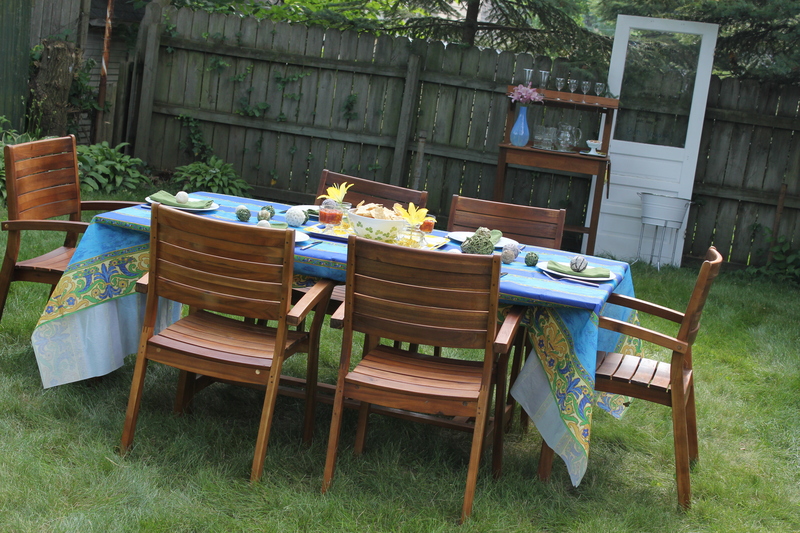 Because the colors of my home compliment this table setting, I was easily able to fill the table and bar with coordinating pieces. Keep this in mind when you’re planning for any event. You don’t want to have to purchase all new pieces for a casual night together, but you can still have a beautiful space to enjoy! Cheers! 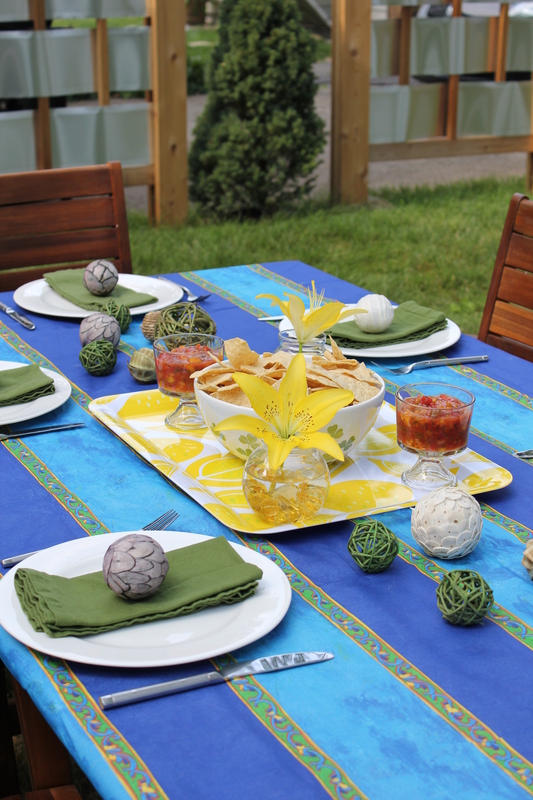 This entry was posted in Event Portfolio, Party Inspiration and tagged blue, cost plus world market, green, lemon, outdoor entertaining, target, yellow. Bookmark the permalink. Thanks! Thank you to YOU for finding the door! Wow, your pictures look great! Real photographic flair, I feel like I’m looking at a home decor magazine or something. Tons of DIY design ideas and really pretty stuff!